When I was approached about a joint commission to write a new work to celebrate the anniversaries of these two outstanding youth bands I was delighted to accept, and decided to respond by writing a work apposite for the magnitude of these special occasions, namely a ‘symphony for brass’. Through a long journey of writing music for brass band, which commenced with Connotations (1977), and continued with Dances and Arias (1984), Of Men and Mountains (1991), The Trumpets of the Angels (2000) and Rococo Variations (2008), I arrived at what I regard as the most important work of the cycle to date, combining as it does serious musical intent with considerable technical demands. It is perhaps my most abstract work for brass band, avoiding any programmatic content. The opening Toccata of my Symphony is highly dramatic but compact, whilst still retaining the ‘traditional’ structural elements of exposition, development and recapitulation; indeed, it also has the ‘traditional’ element of a contrasting second subject – a gentle, lyrical modal melody first heard on solo cornets. In contrast, the longer and more substantial second movement Variations is built around a theme and four variations. The slowly unfolding chorale-like theme accumulates both added note harmony and increasing instrumentation, whilst the four variations which follow are by turn mercurial (fast, starting with all the instruments muted), march-like (menacing, with short rhythmic articulations underpinning an extended atonal melody), serene (a series of ‘romances’ for solo instruments alongside echoes of the chorale) with an emerging theme eventually bursting into a climax of passionate intent; whilst the final variation is a dynamic scherzo (concertante-like in its series of rapid-fire solos, duets, trios and quartets) with the music gradually incorporating elements of the main ideas from the first movement, thus acting as a recapitulation for the whole work. It reaches its peroration with a return to the very opening of the symphony, now in the ‘home’ tonality of F, and thus creating a truly symphonic dimension to the music. Most of the melodic material of the symphony is derived from the opening eleven-note ‘row’, which contains various intervallic sets, and although the work is not serially conceived it does use some typical quasi-serial procedures, such as canons, inversions, and retrogrades. 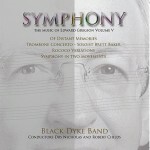 The symphony uses somewhat limited percussion, in line with a ‘classical’ approach to the sound world of the brass band, alongside a use of multi-divisi instrumentation, whereby each player has an individual part rather than the traditional doubling within certain sections of the band. The opening ‘Toccata’ is thunderous, spiky and energetic … then a lyrical ‘second subject’ offers respite before tension and drive recall ‘Mambo’ from West Side Story. The longer second movement, ‘Variations’, begins with gleaming, sustained lines to which a scurrying response excites and leads to a gong-capped climax. Further, bluesy, explorations boil to a cloud-clearing fortissimo and a pulsating conclusion. This is a richly rewarding piece, music that is engaging and satisfying ….